Throughout the 19th and early 20th centuries, Newfoundland had a very high rate of tuberculosis infection and death, much higher than that of Canada, Great Britain or the United States. There were many reasons why tuberculosis took such a strong hold in Newfoundland (see article History of Tuberculosis and Its Prevalence in Newfoundland), and from the early 20th century there were many efforts to control the disease. But consumption, as TB was also known, was not truly defeated in Newfoundland and Labrador until the 1970s. The earliest TB group was the Newfoundland Association for the Prevention of Consumption (NAPC), organized by Hon. John Harvey, a St. John's businessman and Legislative Council member, in 1908. Newfoundlanders had recognized the severity of TB for some time, but efforts to combat the disease had been difficult to organize, largely because of the isolation of many Newfoundland and Labrador communities, as health care pioneers like Wilfred Grenfell discovered. The NAPC focused on overcoming this isolation by disseminating information about TB, and organized a conference for teachers about prevention and treatment. Teachers took this knowledge back to their communities, where they proved to be staunch allies in the fight against TB. The NAPC also raised money and hired a doctor, a former teacher and several nurses to promote prevention and treatment. On the principle that a society has to be healthy to be productive, the government was supportive of anti-TB efforts, and in 1911 recruited Dr. Herbert Rendell and nurse Ella Campbell to lead the anti-TB campaign. They traveled to Britain, the United States, and Canada to study the latest methods of treatment, and toured the island to learn about the disease and educate the population. The combined activities of government and the NAPC gained momentum, and the government created the Tuberculosis Public Service in 1912. However, the cost of sanatoria (quickly becoming the dominant form of TB treatment) and general financial constraints led the government to take over all TB efforts from the NAPC in 1913, and without government support the NAPC was essentially defunct by the 1920s. TB patients had long been advised to take fresh air and a “rest cure.” By the late 1800s, germ theory had reinforced the idea of quarantining TB patients to prevent the spread of the disease. There were several hospitals in St. John's at the turn of the twentieth century, and dedicated sanatoria began to appear soon after. There TB patients could be isolated and provided with medical care in quiet, restful surroundings. An old barracks on Signal Hill was converted into an isolation hospital for smallpox and consumption in 1898, and operated until it burned down in 1920. The Imperial Order of Daughters of the Empire (IODE) opened a summer rest camp for women with TB near Mundy Pond in 1911, and in 1916 Jensen Camp was opened off Blackmarsh Road for First World War veterans with TB. Jensen Camp was largely the work of Adeline Browning, wife of Hon. John Browning. That same year the Escasoni, a large Victorian summer home on the outskirts of St. John's, was turned into a sanatorium after it was confiscated from its German owner at the outbreak of war. The first true sanatorium was built in 1917 on Topsail Road. Originally with 52 beds, the “San” was enlarged several times and became the main location for treating tuberculosis patients in Newfoundland. TB Patients at Jensen Camp, n.d. Tuberculosis patients on the deck of Jensen Camp. Opened in 1916, it was named for Private Philip Jensen of Harbour Breton. Photo courtesy of Newfoundland and Labrador Collection, Provincial Resource Library, A.C. Hunter Library, St. John's, NL. Outside of the capital city, a hospital was built at St. Anthony in 1904. In 1910 one third of the patients admitted there had TB. Additional hospitals built in Twillingate in 1924 and again in St. Anthony in 1927 contained special facilities for TB patients, and a West Coast sanatorium in Corner Brook was opened in 1950. By that time the sanatorium in St. John's had acquired the adjacent Royal Canadian Navy hospital (see Health Care and World War II) and doubled its capacity. In 1954 an additional TB wing was added to the St. Anthony hospital, bringing the total TB beds in the province to 855, the peak of the sanatorium era. As well as being a place for treatment, sanatoria allowed the removal of infected and contagious people from their homes and communities, thereby reducing the spread of the disease. “Rest cures” were overshadowed by surgical treatments (see article History of Tuberculosis and Its Prevalence in Newfoundland) by the 1930s, but TB surgeries were generally performed in sanatoria. By the 1950s, pharmaceutical treatments were rendering surgical treatments and sanatoria obsolete, but a stay at “The San” was a major part of TB sufferers' experiences well into the 1960s. Sanatoria remain one of the most memorable aspects of the fight against TB. By the 1940s the fight to control TB was in full swing. A TB dispensary (which provided free clinics, distributed information about TB, and gathered data) had been opened in 1912, and the Avalon Health Unit was set up in Harbour Grace in 1938 to survey the region for TB using a mobile X-Ray unit. The St. John's sanatoria was in operation, along with hospitals in St. Anthony, Grand Bank, and Twillingate, and TB was one of the major causes of hospitalization in Newfoundland and Labrador. An advertisement for Christmas Seals from the pages of The Happy Warrior. 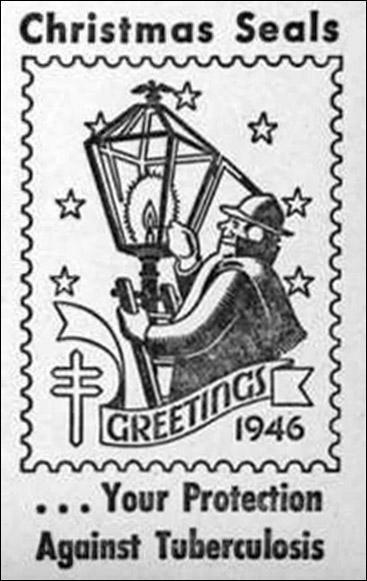 Christmas Seals were developed by a Danish postal worker in 1904 as a way to raise money to fight tuberculosis, and quickly became a major source of funding for anti-TB programs around the world. From The Happy Warrior, Jan. 1947, p. 27. Although these efforts showed some success, they were largely piecemeal, and a dedicated anti-TB organization was needed. Largely through the efforts of Ted Meaney, the Newfoundland Tuberculosis Association was founded in 1944. Meaney was a civil servant and journalist who contracted TB in 1939, and during his stay at the St. John's sanatorium he established The Happy Warrior, a magazine about TB. Through his writings and speeches Meaney secured the help of the Rotary Club (an international philanthropic organization) in founding the Association. With the support of the Department of Public Health and Welfare, the Rotary Club contacted the National Tuberculosis Association in the United States, who in October 1944 sent a representative to assist in setting up the Newfoundland Tuberculosis Association. After Confederation in 1949, the Association became affiliated with the Canadian Tuberculosis Association. The Association's first task was to begin raising money, and it was selling Christmas Seals by December of that year. Christmas Seals had been sold throughout the world since 1904 to raise money for the fight against tuberculosis, and fundraising drives like this allowed the Newfoundland Tuberculosis Association to start paying for their educational newsletter The Northern Light and purchase tools and supplies. The most memorable of these tools was the Christmas Seal, a motor boat which became an enduring symbol of the fight against tuberculosis. The isolated nature of many Newfoundland and Labrador communities was a major reason why TB was difficult to detect and treat. Without access to X-rays, medical advice, and treatment, TB cases in many outports simply had to run their course. 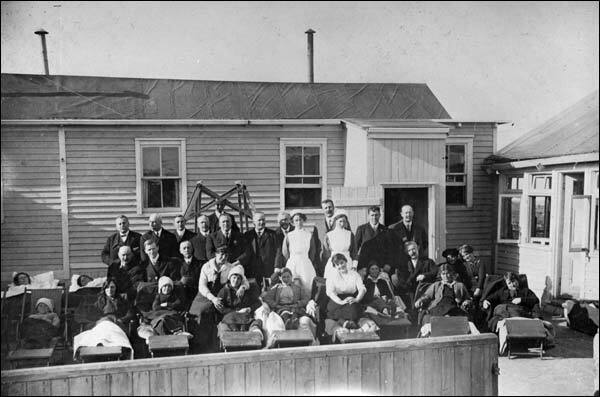 The Newfoundland Tuberculosis Association realized that medical services had to reach these isolated coastal communities in order to fight TB. The Grenfell Association had some success using X-Ray machines aboard vessels, and Walter Davis (who succeeded Ted Meaney as Executive Director of the Association in 1946 when Meaney's health deteriorated further) spearheaded the effort to acquire a floating TB clinic for the Newfoundland Tuberculosis Association. Purchased from the U.S. Navy in September 1947, the Christmas Seal was a former crash boat (used to rescue crew from downed aircraft) from the Argentia naval base. Bought with $14,500 raised through the sale of Christmas Seals, it was equipped to take chest X-rays, test for TB exposure, and show films about TB. The Christmas Seal's frequent trips made it well-known along the coasts of Newfoundland and Labrador. In 1951, for example, the Christmas Seal visited 118 communities and took 10,648 X-rays. 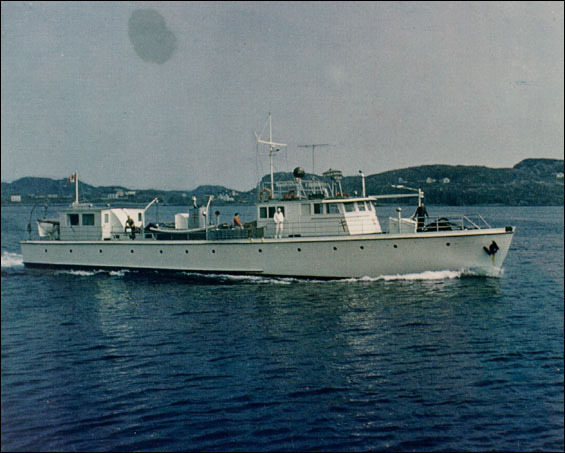 It continued to provide medical services to Newfoundland and Labrador (later expanded to include diabetes testing and polio vaccinations) until 1970, when the increase in the availability of roads made the vessel unnecessary. Former Newfoundland Tuberculosis Association X-ray vessel Christmas Seal entering Twillingate harbour. Photo by Harry Stone. From the Captain Harry Stone Collection. Reproduced by permission of the Maritime History Archive (PF-001.e008a1), Memorial University, St. John's, NL. The Christmas Seal was not the only traveling TB clinic. A rail car was turned into an X-Ray lab in 1948, and a bus was converted in 1950. A trailer was used from 1965-69 (when it was blown over and damaged on the highway near Wreckhouse), and together these traveling TB clinics did much to halt the progress of TB in Newfoundland and Labrador. These mobile X-Ray units, combined with improving medical access and policies of increased screening for TB in hospitals meant that by the 1940s and 50s, TB infections were detected much more regularly, and most people diagnosed with active TB were sent to a sanatorium. There they were treated with ever-evolving techniques, from “rest cures” to surgical treatments such as lung collapse therapy and phrenic nerve crush that became common in the 1930s. By the 1970s, tuberculosis was no longer the dreaded disease it had once been. Living conditions in Newfoundland and Labrador had improved, and better diet, medical care, and education had drastically reduced the rate of TB infection. The BCG vaccine prevented many TB infections, and anti-TB drugs had revolutionized the treatment process. TB victims no longer required lengthy sanatorium stays or surgical intervention. So successful were the new treatments that by 1972, all sanatoria in the province had been shut down, and TB sufferers were treated at home with drug regimens. There were only four deaths from TB in 1973. Tuberculosis is still present in Newfoundland and Labrador, and people are still regularly diagnosed with active or relapse cases. There were twelve diagnoses of TB in Newfoundland and Labrador in 2006, for example. The Newfoundland Tuberculosis Association became the Newfoundland Lung Association in 1982, better reflecting the expanded scope of its activities, away from an exclusive focus on TB towards complete lung health. While drugs ultimately triumphed over TB in the western world (at least for now), improved lifestyles and general health in Newfoundland and Labrador since Confederation also helped defeat tuberculosis. (For more information about the history, pathology, and treatment of tuberculosis, see The Cambridge World History of Human Disease, Kenneth F. Kiple, editor, Or, visit the web sites of the Canadian Lung Association or World Health Organization.